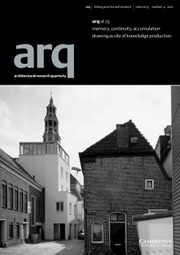 arq publishes cutting-edge work covering all aspects of architectural endeavour. Contents include building design, urbanism, history, theory, environmental design, construction, materials, information technology, and practice. Other features include interviews, occasional reports, lively letters pages, book reviews and an end feature, Insight. Reviews of significant buildings are published at length and in a detail matched today by few other architectural journals. Elegantly designed, inspirational and often provocative, arq is essential reading for practitioners in industry and consultancy as well as for academic researchers.